The Best Airsoft Gun Starter Package just got EVEN BETTER! As a new player, it can be a tricky proposition to find everything you need to hit the field and make sure you don't overspend. But fear not because Airsoft GI has your six, now the Best Airsoft Gun Starter Bundle is packing even more value! We've put together what we believe is one of the best possible package deal you can find to start playing on the field! 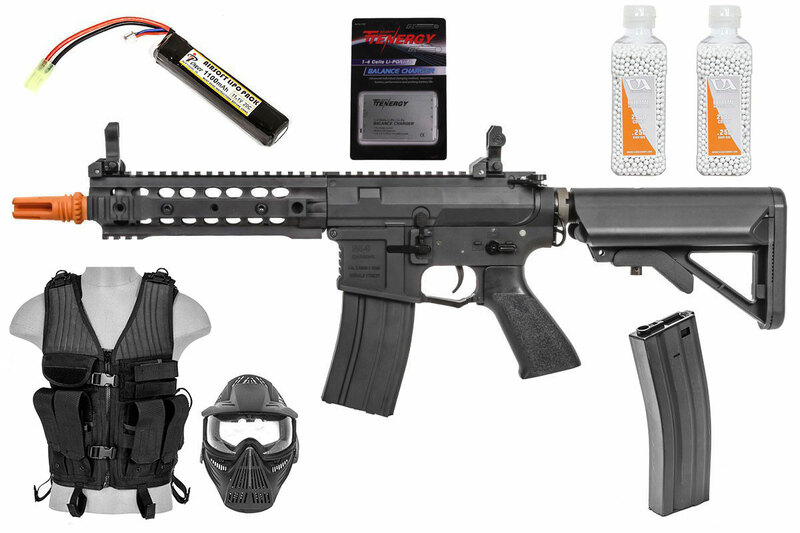 This package includes the Classic Army M4 ARS3-8 Modular Rail Carbine AEG Airsoft Gun which is a great option for lightweight, airsoft combat. Its metal body makes it durable and rugged; while its high quality internal parts will keep you on target and scoring hits with ease! The included 11.1v battery and balance charger make sure that this airsoft gun is ready to go out of the box. To protect your eyes and face, we've included the Classic Army Full Face Mask ( Black ) making sure you have adequate protection for almost every airsoft field. We're also including an extra high cap magazine and two Classic Army Extreme Precision 0.25g BBs to fill them with! Now you'll need somewhere to keep all these goodies and for that we've secured you a Classic Army Tactical Cross Draw Vest ( Black ) to make sure you can carry everything in this package onto the field. Call us at 1.909.869.0671 to get the most up to date answer regarding stock.